Tunisia has always been a popular holiday destination with plenty of beautiful beaches to relax. Although I never say no to a couple of days soaking up the sun, this time discovering the south by 4×4 was on my agenda. It turned out to be a surprisingly beautiful mix of oases, dunes and desert cities. So here are my highlights: 8 things not to miss while visiting Southern Tunisia. Tunisia is the smallest country of the Magreb. Almost the half of the country is covered with desert, and the north (where most people live) is very different from the south: (much) hotter, more traditional and more adventurous. It’s very easy to cover the most important things to see in a couple of days, and the most relaxed way to do that is by booking a 4×4 package tour. Traveling by 4×4 was actually part of the fun: if you’re lucky enough to find yourself an adventurous (but save) driver you’ll have a blast racing through the desert. On our trip there was some serious dune bashing going on, so be prepared to feel totally shaken up now and then. The Berber village Matmata is a popular stop during a road trip through Southern Tunisia. The lunar landscape is remarkable, but the main attraction here are the traditional ‘underground’ houses with artificial caves, going back hundreds of years. Movie lovers already know that Luke Skywalker, the main character of the film series Star Wars, had his home in one of these underground houses: the Hotel Sidi Driss was used in 1976 as the location of Luke’s house during the filming of Star Wars Episode IV: A New Hope. It’s possible to book a room in the hotel, although conditions are quite basic. I guess it’s a must if you’re a Star Wars fan. There are a lot of other Star Wars-locations to visit all over Tunisia but for some of them you’ll have to hurry, especially those located in the south (like Mos Espa) are slowly being swallowed by the Sahara sand. The town Douz is the Tunisian gateway to the Sahara (the Grand Erg Oriental, or the Great Eastern Sand Sea) and known for the annual International Festival of the Sahara, usually held in November or December. Prepare yourself for plenty of sand, palms and a lot of dates as the region is one big palm oasis and the major producer of dates in Tunisia. The city itself is not that exciting but it is a very popular destination for tourists who want to experience the desert. 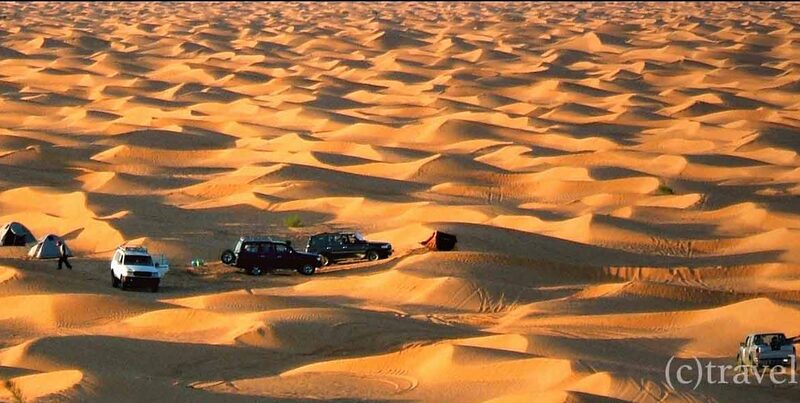 This is you stop for desert treks by camel, horse riding, quad riding, motorcycling or dune bashing. From Douz or Matmata it’s very easy to reach the most southern oasis in Tunisia: Ksar Ghilane (‘ksar’ meaning ‘fort’, and yes, there is an ancient Roman fort to visit). The oasis is located right on the door of the Sahara and is fed by a hot spring where you can swim in. Main attraction however is the desert: hitch a ride with a camel, beat the dunes by car or motorcycle, or just enjoy the magnificent views. There are a couple of tent camps to spent the night. Tip: pull the beds out and sleep under the palms and stars, you’ll love it! This is a great place if you want to explore the desert by day and by night. 5. Chott El Jerid: is that a fata morgana? When driving from Douz to Tozeur you’ll cross the Chott el Djerid, the biggest salt lake in the Sahara (20 km/12 mi at its narrowest point, 250 km/160 mi in length). Most of the time the lake looks white, but when the sun sets or rises, you can see shades of white, green, purple and pink. It’s a bizarre, impressive and isolated place where fata morgana’s occur frequently. It can get steaming hot during the summer, and there are no real facilities along the road – well, there are some toilets along the road – so don’t forget to bring water with you. Tozeur is the biggest city in the Tunisian. Like many other towns and villages in the region the houses here are made of typical yellow brickwork in fascinating patterns. Visit the medina (it’s called Ouled Hadef) to admire these houses. Tozeur is also a large oasis, with countless palm trees. Again, the dates here are very important for the export. Tozeur is a friendly city and an excellent place to stay if you want to explore the region, (touristic) facilities are great. The beautiful mountain oasis Chébika, Tamerza and Mides are only one hours drive away from Tozeur and close to the Algerian border. The villages in the area are abandoned after a flood in 1969. Chébika is a wonderful oasis at the foot of the mountains. It’s a picture perfect spot surrounded by palms. Tamerza is the largest mountain oasis of Tunisia, and if the oasis and canyon of Mides looks familiar, you’ve probably seen it in the 1996 movie The English Patient. You have to walk uphill or take a mule or horse to reach the ruined Berber village Chenini. It used to be a ksar and the cave houses were built on the slopes of the mountain. Chenini dates back to the 12the century and some of the building are still used to store grain by the people living in the modern village (with the same name). Eye catcher of Chenini is the whitewashed mosque. The most easy and relaxed way to travel through southern Tunisia, is by booking a package tour. Just make sure you book with a reliable tour company. We went for the easy (and time-saving) option and booked our complete trip (flight, stay & road trip for a week) with a tour operator in Belgium. AMAZING! I have never seen Tunisia like this… I had no idea it was so beautiful and with so much to do!! Now you just made me add it to my list! I can only imagine how the toilet was! Oh my! Stunning photos by the way! Hi Maria, yes, we’ve visited Medenine but only for a couple of hours. Would love to go back to check it out again. Tx for the visit! Fascinating photos, especially the ones of the desert landscapes. Such vast amount of sand. I’d find it hard to imagine living there. I hear so many adverse things about Tunisia but this post has shown me that there’s a reason to see Tunisia’s beauty. Yes, we mainly see and hear only one side of Tunisia, but this destination has a lot to offer, it was a surprise for me as well. And it’s an easy country to travel.